Oktoberfest time is here! This is certainly a fun time of year for kids and parents alike! 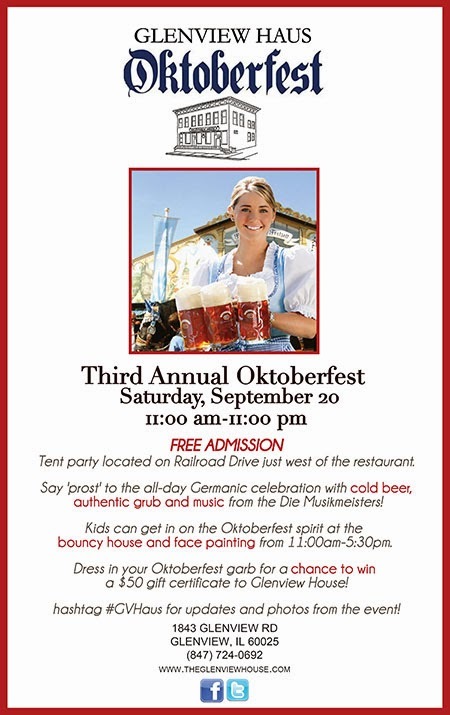 The Glenview House will be hosting its own Oktoberfest next Saturday, September 20th from 11AM-11PM. The festivities will be held under a tent next to the restaurant and will include German music, German grub, a costume contest and kids' activities! Admission to the event is free! Kids activities will include a bouncy house and face painting and will run from 11:00AM-5:30PM. Of course, I am sure the kiddos will also love a Bavarian pretzel! Food will also include brats, potato salad and sauerkraut. Of course, there will also be cold brews including Munich’s Hacker-Pschorr Oktoberfest! If you come dressed in your best German garb, you will be entered in a contest to win a $50 gift certificate to Glenview House so get that lederhosen ready. Sounds like a fun a event and way to enjoy a bite to eat! We have enjoyed several meals at the Glenview House--take a look at at the great food in our previous post! Prost!